Anyone who really knows me, knows that I would go through fire and brimstone to get myself an Auntie Anne’s pretzel and if I find myself in a mall or airport with them available I have to buy one, even if I’m not hungry. The love goes deep guys and I’ll tell you why….nostalgia. I didn’t go to the mall too often when I was kid. My mom had nine of us to keep track of so there was no way all of us were going at the same time. We basically had to take turns. It was then I was introduced and treated to the deliciousness that is an Auntie Anne’s pretzel. I’ve never tasted any soft pretzel better and many years later they still taste the same!!! I bite into one of these pretzels and am immediately transported back to those years when I was young and innocent, with no worries except which flavor ICEE to get along with the pretzel (if Momma Staub was feeling generous enough to allow me two treats that day;-)). This recipe is pretty close to the original and I was so excited when I found it on CookingClassy. My childhood memories thank you and I will be making these as a treat for myself for many years to come! Heat milk in a microwave safe bowl in the microwave until temperature of the milk reaches 110 degrees, about 1-1/2 min. on High power. Pour heated milk with yeast into the bowl of an electric stand mixer (I used my KitchenAid) and mix together until yeast has dissolved. Let rest 5-10 min. Add brown sugar, softened butter, 1 cup flour and salt to milk mixture and stir until well blended. Switch attachment to a dough hook, add remaining flour and knead mixture on medium-low speed until elastic. Mix in up to an additional 1/2 cup flour, as needed, until dough pulls away from the sides of the bowl. Cover bowl with plastic wrap. Place in a warm place for about an hour. Dough should double in size. Line two baking sheets with a silicone baking mat or parchment paper. Once the dough has risen, punch it down to release any air pockets. Divide dough into 6 equal parts. Cover loosely with plastic wrap to prevent a dry crust as you form each ball into a pretzel shape. Roll each piece out into a long thin rope about 32-36 inches long. You don’t need to roll on a floured surface. If any flour is necessary at all, let it be minimal. 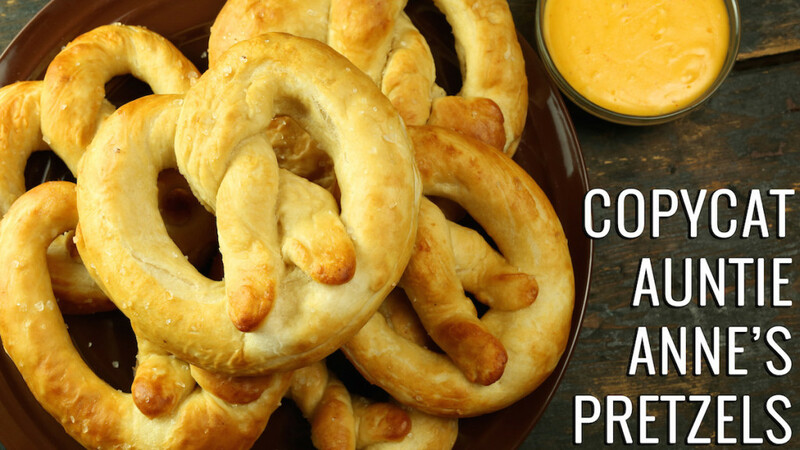 Form dough rope into a pretzel shape by raising the ends of the ropes up, twisting them twice and pressing ends to bottom end of the pretzel. 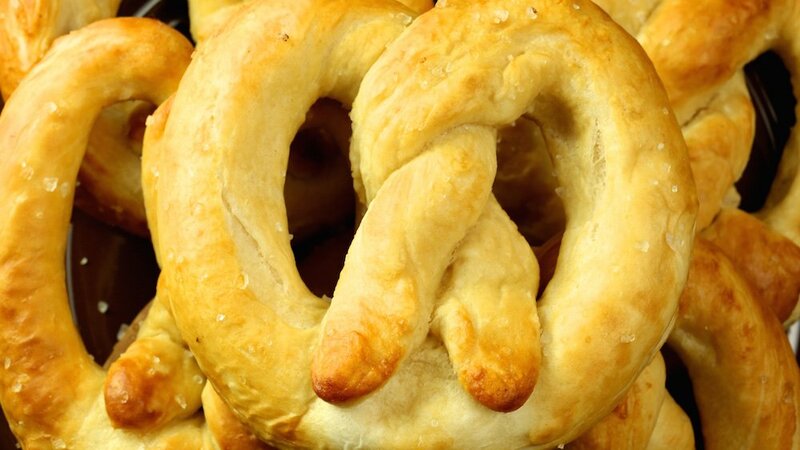 In a shallow bowl, whisk together baking soda and warm water and fully immerse each pretzel. Allow excess water to drip off and place on prepared baking sheet. Reshape as needed and sprinkle on coarse salt to your liking. Bake pretzels for 7-11 minutes, until golden brown. 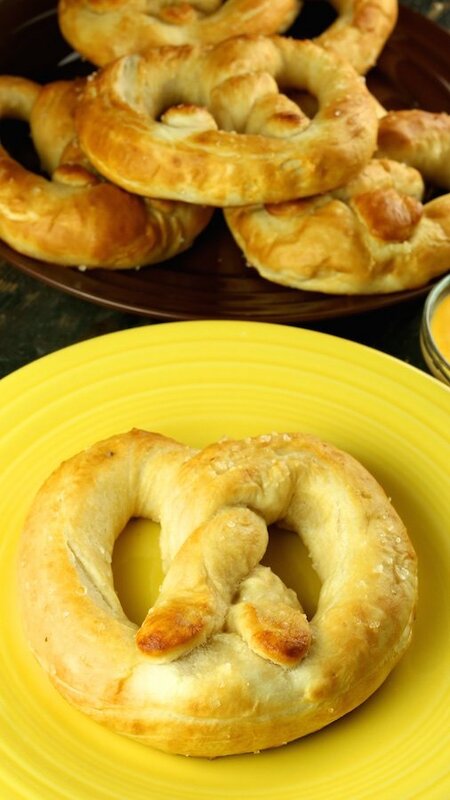 Remove from oven and brush the top and bottom of each pretzels with the melted butter. Pick your favorite dipping sauce or eat plain jane. Close your eyes and remember those good ol’ days at the mall where all was wondrous and grand.